The Kinzua Viaduct is an impressive civil engineering feat and was the tallest railroad bridge in the world when it was completed. It was originally built of iron and was rebuilt out of steel to allow it to accomodate heavier trains. It was listed on the National Register of Historic Places in 1977 and as a National Historic Civil Engineering Landmark in 1982. The Kinzua Viaduct was built to allow the New York, Lake Erie, and Western Railroad and Coal Company to shorten the distance required to deliver coal to Buffalo. The entire viadduct was built in 94 working days. The viaduct was used for heavy rail freight until 1959. The Kinzua Viaduct was donated to the state of Pennylvania in 1963 and is the centerpiece of the Kinzua Viaduct State Park. The state was in the process of restoring the viaduct when on July 21, 2003, an F1 tornado (wind speed 73 - 112 mph) struck the side of Kinzua Viaduct. Eleven towers from the center of the bridge were torn from their concrete bases and thrown to the valley floor. Fortunately no one was seriously injured. And this was the state of the viaduct during our visit. 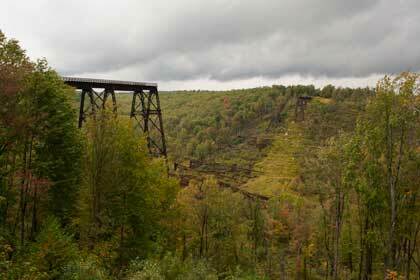 Even with parts of it laying in the valley, the Kinzua Viaduct is an impressive sight. I wish that we could have seen it whole. We were able to explore around the viaduct and took more video than still photos. As far as I can tell the state of Pennsylvania is still studying what to do with the viaduct. 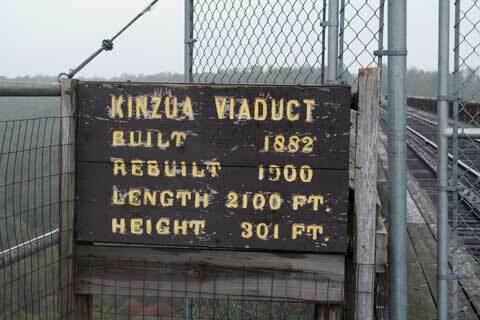 The information on the Kinzua Viaduct website does say some some construction is going on at the site. 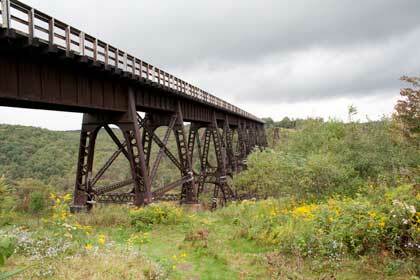 History of Kinzua Viaduct provides a short history of the viaduct and several vintage photos. Travels with Nessie Home :: Site Map:: Contact webmaster@ncsparks.com-email us:: Copyright Leslie Sparks 2006, 2007, 2008, 2009, 2010, 2011, 2012,2013,2019:: Last modified: August 27 2013.